1 of 4 Heat oven to 400 degrees F. In a large roasting pan, combine sausage, onion, green pepper, potatoes, cherry peppers and garlic. Add olive oil and toss together. Season with 1/2 teaspoon of Italian seasoning, 1/4 teaspoon of salt and 1/4 teaspoon of pepper. Place on lower rack of oven. Bake at 400 degrees F for 10 minutes. 2 of 4 Meanwhile, spray a baking dish with nonstick cooking spray. 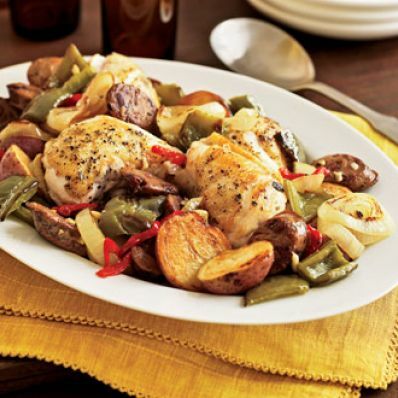 Place chicken in dish and season with remaining 1/4 teaspoon Italian seasoning, 1/4 teaspoon salt and 1/8 teaspoon pepper. Pour broth into bottom of dish. Once sausage mixture has baked 10 minutes, add chicken to oven on top rack. Bake both dishes at 400 degrees F for 30 minutes or until the internal temperature of chicken reads 160 degrees F on an instant-read thermometer and potatoes are fork tender. Stir vegetables twice during baking. 3 of 4 Add chicken to vegetables; cook an additional 5 to 10 minutes or until internal temperature of chicken registers 170 degrees F.
4 of 4 Transfer chicken and vegetables to a large platter and serve.